Series? Yes. No info about 2nd. I loved this book, and it is a well done time travel novel. I was deliciously confused as everything wove together. As far as Em. I knew that the world outside was falling apart, and I just wanted to know why she was witholding information and what got her locked up in the first place. She has an intense voice, and I connected with her because I saw good in her, a desire for freedom, and this sacrificial nature that I really admire. Finn was amazing. I loved their bantering and the chemistry between them. I also liked that there was a history there not just some kind of instant attraction. There was also the time and conversations shared while they were locked up together. As the story progresses you really get to see the depth there, and I love Finn more and more. There is a depth to him, and how he is with his family and with Em makes my heart flutter. At first, when it jumped to Marina, there was a startling contrast of normalcy. Marina is worried about a boy, and giggling with her friends, and I was so curious to see how it all connects. James is her neighbor and the boy she is in love with and has for years. Her support of him, and their history together was sweet to learn about and it became all so important later on, but I had no idea how as I was reading it. Cristin knows how to write a staggering romance, the stolen moments together on both side and things like a hand just the right amount of high on the thigh were all things that made me sigh. As the story unravels I begin to question everything I thought I knew, and examining characters I thought I loved because of pieces of each story that were revealed. And I can't believe it took me as long as it did to connect some of the dots, especially with the Finn clue. But it was still just so emotional and hard to see both sides of the story. It was pretty hard to reconcile the two parts of the story at times, because I didn't see the transformation as slow as it was, it was just the stark contrasts, and that made the story all the better though. By the way, this is one of the most complex and unique love triangle circle jumbles that I have read but since it is two points in time, it makes me love it and my heart was divided because of everything I knew. But it was all so believable. The ending is shocking, bittersweet and heartbreaking. But it wrapped up everything well. Even though I will jump at the chance to get back into this world, I wasn't left with that gaping, can I hurl this book because there is no way that its ending like this, and I am thankful for that. Though I will say that I was a little curious how some of it resolved with a few of the events, but I think I have pieced it all together, and I know that is no flaw on the book but on my reasoning. Great world building, superb romance, characters I loved and felt for, and beautifully woven together. Bottom Line: Intense roller coaster of action, breath taking romance and intrigue. Could you sacrifice yourself to save those you love? This sounds fantastic! I keep hearing wonderful things about this one. Haha, love the "high on the thigh" line :D Totally adding this to my TBR pile. Great review! 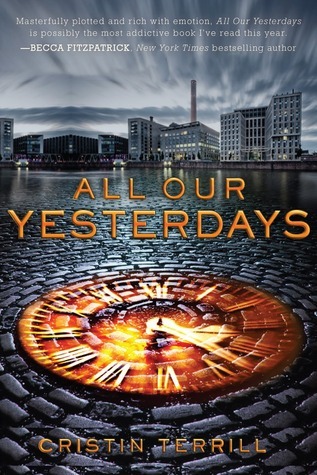 I've been seeing a lot of positive reviews for All Our Yesterdays this week. I'm glad you enjoyed it, Brandi! A good time travel is so hard for me to find. But you scare me with the ending, I don't know if I could handle it. Oh exciting. I've been loving time travels this past year. Hadn't seen this one yet but it sounds great. thanks for the heads up! Great review! I really loved this book. It took me a very long time to figure it out too, don't worry you're not alone;) The characters and the time travel concept were just amazing! I loved this one too. You're right about that ending though! totally heart-breaking! I am so annoyed that I didn't get this one. I have read countless glowing reviews and I love a good time travel book, but they are hard to find. Definitely picking up a copy of this next week! Awesome review. I really need to read this book. I am so excited to read this! I have it on my Kindle and I'm definitely loving time travel books right now. Awesome review! I keep hearing good things about this; sounds like I need to give in sometime soon! Good review. Oh I like action in my books so I think this is one I would enjoy. Thanks for putting it on my radar! Huh, I have yet to read a good love triangle. I just read a review of this and that blogger didn't like it. Now I'm curious to check this out all because of this unique love triangle you mentioned. This one sounds really good and I'm regretting not requesting it for review. I've read a ton of really positive reviews for this one! I've been hearing really good things about this one and I cant wait to read it. Great review! I really need to meet Em and Finn and am so glad to hear the time travel is well done! woot! Sounds like a well-rounded novel. I'm dying to read this one! I enjoyed this one LOADS! I agree that the romance was swoon-worthy, and I was so relieved that it didn't take over the whole plot, like a lot of romances in books do. That ending made me shed a tear or two, seriously. Really can't wait for the sequel! Yet ANOTHER great review about this book which has me salivating for it!! I saw this book somewhere else and read great things about it, I'm glad you liked it as well. I've seen so many good reviews for this! Can't wait to read it! I'm really getting into science fiction and I can't wait to read this book! You don't know how excited I am to hear how much you enjoyed it. This one looks pretty interesting. I might just have to add it to my wishlist. I loved this book! So much. I didn't even realize that Marina and Em were the same person at the beginning. It had been so long since I had read the summary that I completely forgot. It's amazing to watch how Marina slowly transformed into Em. Finn! He was my favorite. I thought the ending was perfect and when I finished it, it hadn't been announced that there was going to be another book. I'm sort of worried about it honestly. I don't see a need for a second book. I thought this one wrapped up everything nicely and heartbreakingly, with a good hope for the future. Bittersweet is a perfect word to describe the ending. Glad you liked this too! Initially I wasn't very interested in this but the more I read about it, the more interested I become. I especially love time travel and that you are content with the end-I hate an ending that leaves a bad taste in your mouth. Glad you enjoyed this one. I can't wait to read it. The reviews so far have been really good. I feel like I've been waiting months!! !